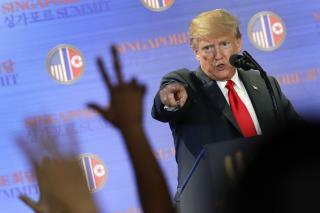 (Newser) – Before the event took place, President Trump said his historic summit with North Korean leader Kim Jong Un showed Otto Warmbier "has not died in vain." He upped that rhetoric Tuesday. "Without Otto Warmbier, this summit wouldn't have happened," Trump said, per Time. "It was a terrible thing," the president added of the US college student's death almost exactly a year ago after he returned unresponsive from a stint in a North Korean prison camp. But "something happened from that day," Trump said. "A lot of people started to focus on what was going on—including North Korea." Trump’s new bff’s are: Kim, Vladimir and any other world dictator. He alienated allies that we’ve had for decades to go and play with his friend, Kim Jong Un. What happened to the bromance with Emmanuel Macron? That soured rather quickly. Ridiculous. President Trump would have met him either way. Warbier had absolutely NOTHING to do with this meeting. If anything, it would have prompted a no-meet. I suppose by now we shouldn't be surprised that the vulgar gore-whore in the White Hoax will use anything he can to score political points.